The Ireland Indoor Lacrosse programme has gone from strength to strength since the first participation of an Irish team in a box event back in 2005. Since then, the indoor programme has expanded to include the original Dublin Riggers team that started it all in 2005, the Emerald Islanders national development team, the Dublin Box Lacrosse League (DBLL) which would become the National Indoor Lacrosse League (NILL), and the participation of the Irish National Indoor Team in three world championship events – 2007, 2011 and 2015. As the national team looks forward to participating in the inaugural 2017 European Box Lacrosse Championships – it is timely to look back at the progress which has been made. 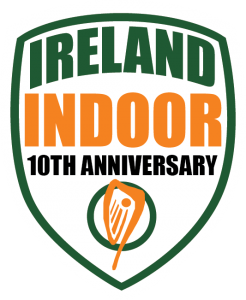 Ireland’s indoor journey began back in 2005 when the Dublin Riggers was organised by Sean Gibson to compete in the first ever box lacrosse tournament participated in by an Irish based team. 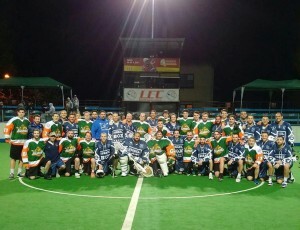 The 2005 HarBour LaxTC box lacrosse tournament in Rotterdam, The Netherlands would be Ireland’s first official foray into box lacrosse. The team was made up of Irish residents like Sean Gibson, Michael Kennedy, Tony Devine, Joe Caulfield, Eric Timmereck, and a few guests from abroad. The Riggers would go on to finish second overall to LCC Radotin of the Czech Republic. The following year, the Dublin Riggers would participate in the Ales Hrebesky Memorial in the Czech Republic. It was participation in this tournament – the premier box lacrosse tournament in Europe – that cemented the Indoor programme in the Irish Lacrosse scene. The Dublin Riggers was originally intended to be Ireland’s official club touring team for box lacrosse events. In those early years, the team was entirely made up of players from in and around Dublin. While still the majority of the team consists of Irish Internationals, the team has evolved to bring together Irish Internationals, Canadians, and Americans for lacrosse and friendship. 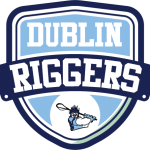 The Dublin Riggers have been in attendance at every Ales Hrebesky Memorial tournament since 2006 and recently competed in their 11th consecutive tournament. They have become one of the tournament’s favourite teams for their style of play and flair. They continually enter the tournament with some of the most difficult draws and have achieved a high of 5th place twice over the years. The Dublin Riggers have also had an impact on the national team with 25 Senior Irish Internationals in their ranks over the years. 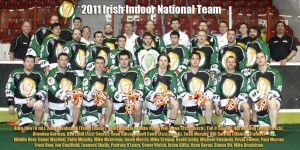 In 2015, the Irish National Indoor team had 14 past or present Dublin Riggers. Ireland began building on the efforts of the Dublin Riggers and worked towards its first international appearance. That appearance would be the 2007 World Indoor Lacrosse Championships in Halifax, Nova Scotia. This tournament would be Ireland’s first foray into the World Championship structure. The team was faced with a major challenge before the tournament had even begun as the team’s Head Coach Paul Stewart was unable to travel for medical reasons and Assistant Coach Jeff Garlin would have to take the helm. The team held its training camp at St Francis Xavier University in Antigonish, NS. The StFX connection would pay dividends as, alum Brendan Smithson was asked to work alongside coach Garlin during training camp. Ireland would play exhibition games a Halifax Sr. B team during the 4 day camp a game the young national team was fiercely competitive in. They would draw a tough group in the round-robin, opening the tournament against Canada then having matches against the USA and the Czech Republic. Ireland would feature in the official tournament opening game against Canada and Irish National Team Captain Sean Gibson would be involved in the official ceremonial face off against lacrosse legend and Team Canada captain John Tavares. The game would prove to be a white-wash with Ireland on the bad side of a 25-1 defeat but, in that game a legend was born. Mike Ryan would score Ireland’s only goal which sent the home crowd into a frenzy. This goal would inspire the ‘Ballad of Michael Ryan’ a song written some time later. Ireland would go on to finish with a record of 0-4 in the tournament but, things were looking up for the Irish as they managed to run Australia close in their last game. The Dublin Box Lacrosse League (DBLL) was created by Sean Gibson in 2007. This represented the first ever indoor lacrosse league on the Island of Ireland. The DBLL was a huge success and ran for the next three years. 2011 would be a watershed year for Indoor Lacrosse in Ireland as Sean Gibson was named to the Ireland Lacrosse Board of Directors as the countries National Indoor Lacrosse Director. This appointment was to facilitate greater planning and development for the sport in the country as well as greater representation at the international level. This appointment along with participation by the national indoor team in the first ever international box lacrosse tournament held outside of North America – the 2011 World Indoor Lacrosse Championships in Prague, CZ. 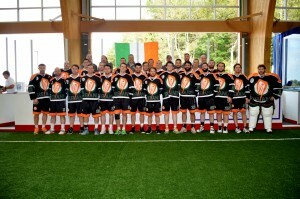 Ireland started the 2011 campaign making big strides forward with their national indoor programme with the inclusion of Head Coach Jeff Dowling and his team. Jeff was previously a member of the coaching staff of Team Canada which had taken gold at the 2007 tournament. The team would name Brendan Gorman Captain with Sean Gibson and Tim O’Connor named assistants. Ireland would find themselves in a tough bracket facing the Iroquois, USA, and the Czech Republic. After losing the first two pool games against the Iroquois and team USA, the Irish National team came out flying against the Czech Republic. However, the hard work would be undone when starting goalie Mike Cregan would succumb to injury and was forced to leave the game. Ireland would give up a 6-0 run to the Czechs and would never recover. Ireland would then play a two game playoff for 7th place against Slovakia and it would be Ireland’s 4th game of the tournament that would prove to be the most memorable. Ireland would get out to a 4-1 lead by half time with long time national team player Kevin Owens grabbing two goals while Brian Gillis and Tim O’Connor chip in with a goal apiece. The two teams would play a fairly evenly contested second half. The game would see Ireland emerge with their first win in four years and hat tricks for Brian Gillis and Kevin Owens. The final game of the tournament would see an exhausted team Ireland on the receiving end of a 10-7 loss and the team would finish the tournament in seventh place with a record of 1-4. Brian Gillis emerged as the team’s top scorer with nine goals and four assists. 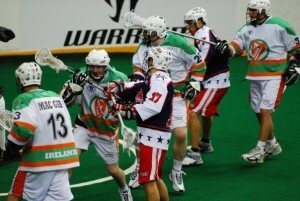 2012 saw the return of a revamped National Indoor Lacrosse League with a new home in Dublin. Each year the teams would retain three ‘franchise’ players and the rest of the participants would go into the annual draft. The league usually runs for 6-8 weeks giving Irish domestic players an opportunity to play box lacrosse on an annual basis. The NILL has been highly competitive over the years and its participants have made a huge impact on the National Team Programme as a whole. The team consists of three teams and over the past five years all teams have won the league at least once. The Darkside has been three time champions including back to back in 2015 and 2016. It was decided in 2013 to develop a National Development Team for indoor lacrosse to mirror the highly successful Éire programme for men’s and women’s field lacrosse. In November of 2013 the first Islanders team finished as runners-up in the BoxMania tournament in Lille, Fr. The 2013 Islanders had a large contingent of the 2011 Irish National team including Brendan Gorman, Tim O’Connor, Sean Gibson, Ryan Doran, and Michael Bradshaw. The team also included future national team players Dan Kelly, Conor O’Brien, Conor Dockery, and Tadhg Bolger. The team was coached by National team assistant coach Geoff Conn. The Islanders travelled to France again in 2014 and battled hard in the tournament coached by Sean Gibson and led by Michael Kennedy, Ryan Doran, Tadhg Bolger, and Conor Dockery and future Irish international Drew Wichmann. The team had a positive result finishing the tournament in fourth position. The Emerald Islanders would take a shift in 2015 to more international styled lacrosse by working with several nations to create the European Box Lacrosse Invitational. This event would allow National teams and National development teams to compete in an international atmosphere under full international rules. The 2015 Islanders were coached by National team assistant coach Tom Howe who made the trip over to Prague with the team. The team played highly competitive games against Israel, Czech Republic, and newcomers Switzerland. The team featured 13 players that would eventually feature in the 2015 World Lacrosse Championships. While results weren’t the priority the team was highly competitive in every game. 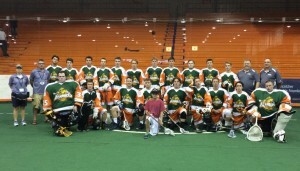 The World Indoor Lacrosse Championships in 2015 were held on Onondaga Nation, the birthplace of the sport of lacrosse and hosted by the Iroquios Nationals. The tournament as a whole would be a celebration of the sport and the history of the game on indigenous lands. Ireland had a good run in to the tournament with a highly successful try out in Dublin in October of the previous year. A short documentary was filmed about the 2015 team trials by Tom Beary. The team was once again coached by Jeff Dowling and his staff. Ireland would feature several stalwarts of the Irish National team programme. Players like Brian Gillis, Michael Kennedy, Sean Gibson, Kevin Owens, Zak Jordan and Mike Cregan were joined by NLL stars Andrew McBride and Stephen Keogh. The team also featured 11 players who would be making their first appearance in the green jersey of the indoor team. The 2015 team would select Andrew McBride as the team’s captain alongside Michael Bradshaw and Sean Gibson as the team’s assistant captains. Ireland would battle through a tough round robin group. We would earn victories over Serbia and Germany and run in to a tough Israeli team. This would allow Ireland to advance into a playoff against Australia. Ireland would earn a 12-4 win over Australia with Stephen Keogh having an eight-point game. The win set up a quarter final appearance against a strong USA team. Ireland would suffer a tough defeat against the USA in the quarter finals and would be resigned to playing for fifth place. 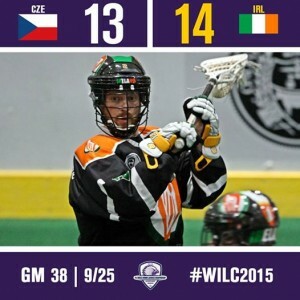 Long-time rivals and European box lacrosse leaders the Czech Republic would meet Ireland in the 5th place playoff. This would be true test of the Irish team’s resolve. The game was hotly contested with 17 lead changes in the game. Ireland would get out to a three goal lead early on with goals coming from Gillis, Owens and Jordan. But, true to their pedigree the Czechs would answer back and would eventually have a narrow 5-4 lead into the second quarter. The teams would continue to battle back and forth through the second quarter it would be the Czech Republic which would carry a narrow 9-8 lead into half time. Ireland’s defence would take over allowing Ireland to stay even with the Czechs into the fourth quarter. Ireland would trail by one with just under five minutes to go when Kevin Owens would tie the game at 12 apiece. Both teams would trade possession in the final minutes of the game and it would transpire that Ireland would be left with the final possession of the quarter. With 24 seconds on the clock, Coach Dowling called a timeout and organised his offence. With clock ticking down and the goalie out of the net, Ireland’s Sean Gibson would score with 3.4 second on the clock sending the Irish bench into celebration. With a few anxious seconds on the clock, Ireland’s Kevin Owens would tie up the face off enough to allow the clock to expire. Brian Gillis led the way for the Irish with three goals and three assists while goalie Mike Cregan and his defensive unit would stand tall throughout. This game would also mark the first time in eight years that an Irish team would beat a Czech National team in box lacrosse. Ireland had one final game for fifth versus England in what was always going to be a fiercely contested rivalry. This was no more evident than the 47 minutes in penalties in the game. But, despite a second half comeback led by Stephen Keogh (4 goals/6 assists), after falling behind 9-4 at half time, Ireland would come up on the short end of a 12-14 loss. But, overall Ireland’s record of four wins and four losses and the resulting 6th place overall would see tremendous strides forward taken by the national team. The Emerald Islanders would feature on both sides of the Atlantic in 2016. The Islanders would return to the European Box Lacrosse Invitational. The development team would meet Israel, Germany and would also play one of Europe’s newest nations Sweden. The team would feature a mix of players from the 2015 national team and several newcomers to the Irish setup. The Islanders would play close games to Israel and Sweden losing both games by one goal. The Islanders would beat Germany 17-7 in the other game of the invitational. The summer of that year saw the biggest development where Ireland’s National Team Head Coach Jeff Dowling and assistant coach Clancy Almas would lead the first ever Islander U-19 team to the IIJL World Junior Lacrosse Challenge. The Islanders would be led by Chris McLaughlin, son of National Team Equipment Manager Gus McLaughlin, Matthew Duncan, Tyler Conn, and Aidan Conlon. The Islanders would finish the tournament in fifth place earning two impressive victories over the USA and one against Iroquois East in overtime. Along with participation, Ireland as a nation, has long been a proponent of the Indoor game on the international Lacrosse scene. This is no more evident than when Sean Gibson was appointed Coordinator for Indoor Lacrosse by the European Lacrosse Federation in 2013. Since then Sean has been instrumental in the development of the ELF’s Annual Box Lacrosse Forum, European Box Lacrosse Invitational, Refereeing Certification Programme, Running of Player Development Camps, and pushing for and ultimately oversight of the first ever European Box Lacrosse Championships which will take place in Turku, Finland in July 2017. This year is a historic year for the programme. 2017 marks ten years of International box lacrosse involvement and with recent partnerships with STX Lacrosse and Under Armour for equipment and Apparel respectively, we are going from strength to strength. Our National team programme is already preparing for our involvement in the 2017 European Box Lacrosse Invitational. The national team has already been selected and is looking forward to success at the first ever European Box Lacrosse Championships which, already looks bigger than the 2015 World Indoor Lacrosse Championships. For further information about how you can get involved and help the Irish Indoor Lacrosse Programme, please contact Sean Gibson at: sgibson@irelandlacross.ie. MENS 2019 Selection Events for 2020 Tournaments Announced!